Sick of government surveillance spoiling the freedom and fun of the Internet? You’re not alone. And now there’s something you can do about it. Reset The Net is a day of global action to secure and encrypt the web to shut out the government’s mass surveillance capabilities. Tens of thousands of Internet activists, companies and organizations — from across the political spectrum and across the technology industry — have committed to preserve free speech and basic rights on the Internet by taking simple steps to shut off the government’s mass surveillance capabilities. And you can join them. Participating organizations, sites and companies include the Libertarian Party, Fight For The Future (who initiated the campaign), reddit, CREDO Mobile, Namecheap, Imgur, Greenpeace, FireDogLake, Thunderclap, DuckDuckGo, Disconnect.Me, Demand Progress, Access, Free Press, Restore the Fourth, AIDS Policy Project, PolitiHacks, OpenMedia, Free Software Foundation, Bill of Rights Defense Committee, Code Pink, Popular Resistance, Participatory Politics Foundation, BoingBoing, Public Knowledge, Amicus, New America Foundation’s Open Technology Institute, Progressive Change Campaign Committee, Student Net Alliance, and the Center for Democracy and Technology. These and other organizations will participate by publicizing the effort and by improving their own security and/or promoting privacy tools to their followers. Individual Internet users can act with Reset The Net in several important ways. They can get and install a free “privacy pack” of safe open-source software tools that make end-to-end encryption easy, as well as learning other ways to secure their online life against intrusive surveillance. Information on how to do this will be available from Reset The Net. Individuals are also invited to sign a petition supporting online freedom and pledging to participate in the campaign. So far nearly 20,000 people have done so. 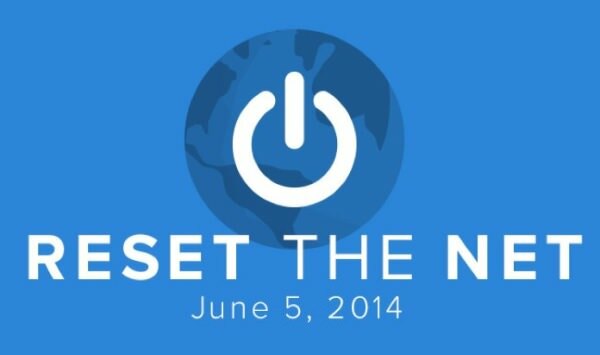 Reset The Net hopes to have at least 50,000 signatures by the June 5 kick-off date. Reset The Net will offer supporters a splash screen they can run at their web sites on June 5. These screens will potentially reach millions with a call for privacy and a link to the privacy tools pack. Twitter users can join the #ResetTheNet Twitter brigade to further publicize the idea. Still more suggestions are at the Reset The Net website. For more information watch the short ResetTheNet.org campaign video and visit ResetTheNet.org.